Making a whole chicken last for several meals is probably something my grandmother knew a lot about. My generation however, may be lacking in this skill since it’s easier and more convenient to buy a bag of chicken breasts and move on with life. So why should you consider buying a whole bird? Well, you can normally find them on sale for less than $1 per lb. which is a steal compared to the chicken breasts that are usually priced for double or triple that price. Plus, you can make stock from the leftovers and dealing with the whole bird is a stark reminder that life was lost at the expense of the meal. So today I thought I’d show you how to get several meals from one bird in order to make the most of your money. These recipes should feed 4 comfortably with some leftovers. Step 1: Place veggies in slow cooker. Step 3: Remove plastic and organs. Place bird on top of the veggies. Step 4: Add salt and seasoning of your choice. Step 5: Set slow cooker on low for 6-8 hours. Step 6: Remove chicken and shred meat. *Do not throw out liquid or bones! Step 7: Serve small portion of chicken with veggies and bread. *To make stock for next recipe, add uncooked veggies (carrots, onions, celery, garlic, etc) to leftover over chicken carcass in slow cooker. Cover with water and cook on low overnight. In the morning, strain the broth and discard remains. At this point you can let the broth cool down in the fridge and remove the hardened fat or you can use it as is in the next recipe. If you don’t remove the fat then it will be greasy. Step 1: Add all ingredients except pasta to slow cooker. Step 2: Cook on low 6-8 hours or until veggies are tender. Step 3: Cook pasta and add to soup. Serve with bread. Step 1: Mix all ingredients in bowl and let refrigerate at least 2 hours. Step 2: Layer mixture between bread and serve with chips. That's awesome! I get the whole chicken from Aldi too! Hi! I found you on the mom2mom link up :) What a great post! I love that you're using the slow cooker for most of these recipes - so great to know that supper is ready to go at the end of the day when your energy is running low. Blessings! Hi, I am visiting from the Frugal Friday Link Up Party! We use a lot of chicken in my house! I am going to try all of these recipes in the near future. Thanks for sharing! Thanks for posting this. Being a Pre-K teacher, I am always looking for crockpot ideas to assist me in quick meal preparation! Fantastic ideas. Thanks!! Hi. I love your site and would love to print some of the recipes and ideas, but I can't get them to print. Am I doing something wrong? Can't wait to go home and cook a chicken now. Thanks! Have you tried the print button below the article next to the sharing buttons? Let me know if that works! Otherwise you could copy and paste the recipe into Microsoft Word and print that way. Sorry you are having trouble! I hope it works well for you! I think the trick is pre-portioning it and only using 1-2 cups of meat per recipe. Thanks for posting this! 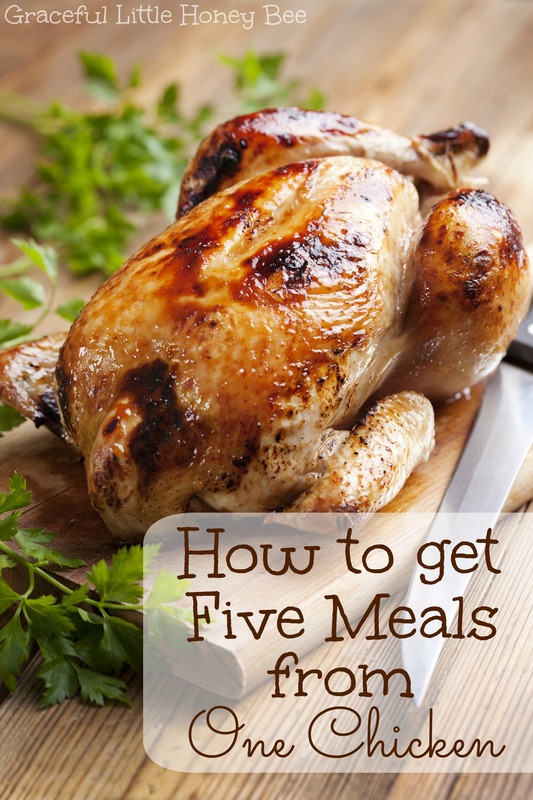 I never thought you could make 5 meals out of one chicken. We buy our chicken organic though and have a family of 5, so we might have to double the recipe. I'm feeding 2 adults and 2 toddlers with these meals and we normally have plenty of leftovers. Two chickens might work better for your family though. Just wondering why you need to discard the veggies that have been cooking with the stock? Couldn't they be pureed with some of the stock to make a soup? Of course you could do that if you wanted too! I love doing this with a chicken. Another house favorite is take about 2 cups shredded chicken and bottle of bbq sauce and make bbq chick sliders... Yum! Been doing this for years! I don't have a slow cooker, so mine is roasted in the oven. I usually make gravy and have leftovers of that as well. A couple more ideas for variety: - use about a cup of leftover chicken, some of the gravy and some veggies. Put it in a pie plate. I either use pie crusts or just top it with biscuits. Bake and enjoy. - make a chcken corn chowder. I use creamed corrn along with some regular corn, potatoes, broth, milk and spices (favorites are paprika and a dash of cayenne). I can't figure out how you can feed 4 people from the first chicken then get enough shredded chicken for the other recipes. Is it just me or is it 5 single-serve meals from one chicken. Which seems more likely. I can get 5 full meals that feed four people. (Two adults and two toddlers) I only serve about 1/4 or 1/2 cup shredded chicken per person for the first meal and then portion what's leftover between the other meals which is normally between 1-2 cups per meal. If you have a large family or a family of big eaters you may need two chickens for this to work. How big is this chicken and how big is your crock pot.? I could never get a big chjicken in my crock pot. I didn't record how large the chicken was when I wrote this out, but I'm going to guess it was around 5 pounds as that seems to be the average size in our local grocery store. My slow cooker is between 7 and 8 quarts. I'd say it's a medium sized slow cooker compared to what you can find on the market. These are kind of recipes im looking for... Im single and on SUPER tight food budget, but if I do a meal plan and freeze leftovers I should be able to have more options for dinner. Thank you. You should be able to get lots of meals from this plan as a single person! I guess it depends on your family but i feel like the chicken probably wouldnt last past the 3rd recipe in my house. But i LOVE LOVE this idea all the same and i will have to give it a try. 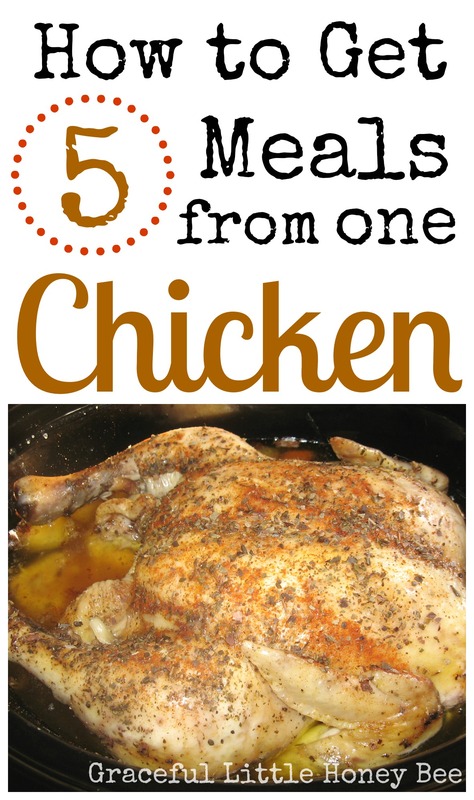 I love your ideas for 5 meals out of one chicken. I would add chicken tacos with lettuce, tomato, and avocado in the taco on top of the meat.